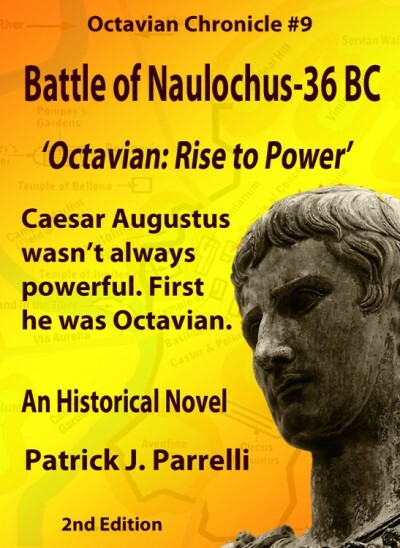 Note: The Treaty of Tarentum is a subplot in the story of The Battle of Naulochus. Agrippa said, “Let’s go to my cabin. I’ll go over the plan with you,” As soon as Octavian, Maecenas and Balbus were standing around the table where the maps were spread out, Agrippa began. “We’re going to attack Sicily from every direction. Sextus has his men and ships concentrated here in Messana, in the northeast coast of Sicily. He’s well-fortified there. 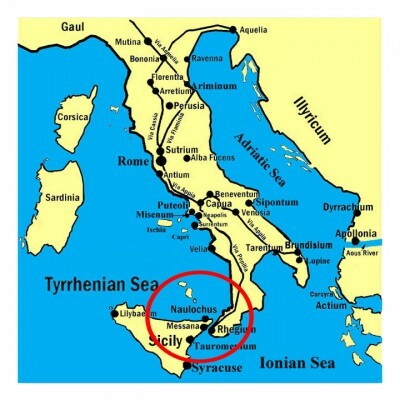 “Lepidus will sail up from Africa, land his legions in western Sicily, and march east to Messana.” He pointed to Tarentum on the south shore of Italy. “I put Statilius Taurus in command of the one hundred twenty ships that Antony gave us. When the time comes, he’ll sail west toward Messana. A large land army will follow along the shoreline with him. “If he sails up to attack me, he’ll leave Messana unprotected, and we’ll be able to safely transport Statilius’ land armies over to Sicily from Italy. “Let me show you something else.” Agrippa went to the cabin door and made a motion to one of centurions. A few minutes later, two soldiers came walking in carrying a seven-foot-long, metal-clad wooden pole with a grappling hook attached at one end and a ring attached to the other end…..